Click here to read more reflections from former Writing Studio consultants. Are you interested in joining a committed and engaged community of writers who work to support fellow writers? At the Writing Studio, we look for consultants from all majors who have excellent communication and collaboration skills and are highly motivated and eager to learn. We also welcome and encourage applicants who are multilingual or who have experience supporting language learning. In January 2019, the Writing Studio will begin its hiring process for 2019-2020 Undergraduate Writing Consultant positions. All Vanderbilt undergraduates with an overall GPA of 3.5 or better are welcome to apply. See below for application instructions and for ways to learn more. Writing Consultants work one-on-one with writers at all levels and from all disciplines, assist with outreach by visiting classes to promote the studio, and participate in ongoing staff education. Candidates for Undergraduate Writing Consultant position should demonstrate strong written and verbal communication skills; they must be excellent academic writers, producing strong essays in their disciplines; also, they should be comfortable working with diverse types of writing assignments. Candidates must have effective interpersonal skills, including the ability to work with people from diverse backgrounds and the ability to engage in constructive dialogue about writing. They should also be flexible, patient, professional, and intellectually curious. participate in weekly, full-staff training sessions throughout the academic year. engage in periodic observations and mentoring sessions. contribute to ongoing projects when shifts are not fully booked (including updating or developing resources for undergraduate writers). visit classrooms across campus to introduce Studio services. attend and support Studio special events (such as the Undergraduate Writing Symposium). demonstrate engagement with and growth in the position. *The August training takes place on the Tuesday-Friday the week before classes begin each August. Attending the training is mandatory for new consultants, and applicants should note that it regularly conflicts with required trainings or orientation activities for VUceptors, RAs, Ingram Scholars, and several other campus programs. Join us for one of two information sessions in January 2019 to hear from current undergraduate consultants, to learn more about the application process and the job itself, and to get your questions answered and begin thinking critically about putting together a strong application. As of Spring 2019, instructor nominations are no longer a required element of the undergraduate writing consultant application, although they remain a valuable means by which potential applicants can learn about the opportunity to work at the Writing Studio. All applicants must fill out the online undergraduate writing consultant application form. We recommend using a text document to prepare your application answers and transferring them to the form. Application letters and writing samples (see below) may be attached to this form. Please press the submit button at the bottom of the page to complete your application. Applicants will receive a confirmation email when their application has been received. 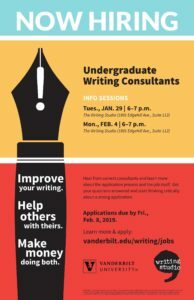 An applicant must write a letter of application to the Writing Studio directors detailing her or his interest in and qualifications for becoming an Undergraduate Writing Consultant. An applicant might write about the following: ways in which her or his experience would contribute to successful consulting; strengths and weaknesses as a writer; ability to work well with other people; applicable writing or work experience; or relevant personal and/or career goals. The recommended length is 500-800 words. An applicant must include a sample of polished academic writing. The sample should be chosen to showcase your strongest analytical or argumentative writing and should have been produced for a Vanderbilt course (any discipline). * Recommended length is 5-15 pages, but you may submit a longer or shorter piece if you feel it best represents your strengths as a writer. The writing sample, as well as other application materials, will not be returned. As part of the online application, you will be asked to contextualize your choice of writing sample, which is your chance to explain the prompt as well as to highlight what you see as its strengths. 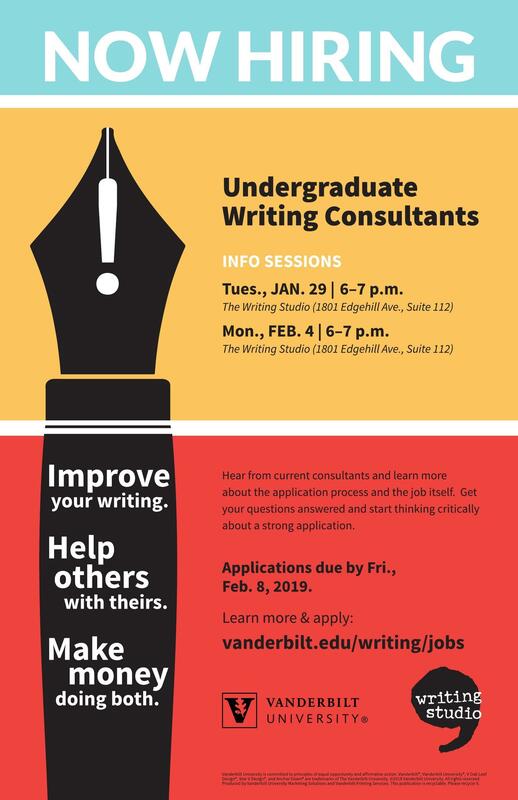 Applicants are encouraged to schedule a Writing Studio appointment to get feedback on their application letter and choice of writing sample and to familiarize themselves with the Writing Studio and the work our consultants do, in general. We welcome applications from students who have applied in previous years, but encourage all to write a new letter of application and update their selection of writing sample. Any technical questions or concerns about the application or the web form should be directed to Sarah Friddle, office administrator, at writing.studio@vanderbilt.edu or 615-343-2225. Students who complete the application requirements by the given deadline may be invited to attend an interview in late February or early March 2019. Questions? For more information email John Bradley.